We talk a lot these days about pedagogy, but what do we actually mean? Obviously, we know what the dictionary definition is: the method and practice of teaching, especially as an academic subject or theoretical concept, but I think we’re far more concerned about methodology than we are about practice. How can I convince them that success in this subject is just a set of habits that need lots of practice? How can I make those success habits explicit and ensure they weave through every lesson? As Barry points out, sometimes teachers spend rather too much time thinking about how to do AfL or some other trendy gimmick. 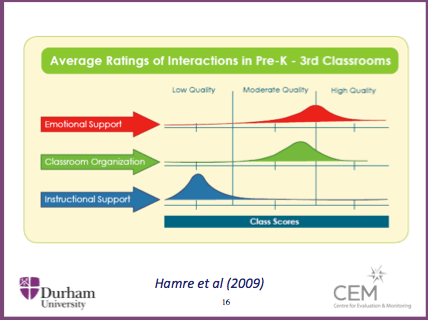 Hamre, B.K., Goffin, S.G. & Kraft-Sayre, M. (2009) Classroom Assessment Scoring System Implementation Guide: Measuring and Improving Classroom Interactions in Early Classroom Settings. After mulling this over for a while I think maybe one of the reasons we’re not as great at instructional support as we could be is that all this gets boiled down to the steaming fat of ‘pedagogy’. I’m convinced that pedagogy is, at best, a pretty unhelpful label, and at worst just the kind of obscurantist Latin mass that requires a priest class to explain to us mere mortals. It’s gimmicks rather than routines, and tricks rather than hard work. Much better to think about what matters in our practice, and be alert to what happens in our classrooms. How can one invoke in a class the emotional state most productive for: (a) prosocial behaviour, (b) evaluative thinking, (c) memorisation, (d) creation? How can we get pupils to think about what we want them to learn? How can we best infer learning from pupils’ performance? How might difficult threshold concepts be taught most effectively? How should we organise a curriculum to maximise long-term retention and transfer of knowledge? How best can we encourage pupils to commit to deliberate practice and the mastery of new skills? How best can we judge the effectiveness of a teacher, and how can we replicate what they do? These are all questions which might matter to teachers, questions which might be worth thinking about. Maybe rather than pillaging the next pedagogical convoy that happens to roll past we could instead think about what matters to us, and then starting having a look for some answers. Maybe you don’t like mine, Barry’s or Laura’s questions; maybe they’re not what matters to you. But what are your questions? Update: maybe this post from Tait Coles on the style and code of education might prompt a few questions. And here are Joe Kirby’s questions. I love the idea of Key Questions – one of my favourites is “what is the difference between what you are doing and what you are learning?” I rather like “pedagogy” precise because I think of it as practice…..
That’s a great question! I’m not sure what your point about pedagogy is though? Thanks Alex – I was in a bit of a rush – have now included links to all the posts on laura’s touthpaper problems. Really sorry I wasn’t at the party. I don’t understand your point about the term pedagogy. Its the word for talking about the practice of teaching and learning. Should anthropologists not talk about anthropology? Escape artists not discuss escapology? See my response to AQ. Yes, use it, but don’t hide behind it. ‘Pedagogy’ is used to cow the masses and conceal all manner of stupidity. Reclaim it and unpick precisely what it means to you. With respect that’s not what you said in the blog. But I agree if that’s what you meant. Isn’t that more or less the same thing? We could go round in circles on this. But no. Your polemic obscured your intention. I’m glad it is now clear. Yes – ask lots of interesting questions about teaching and learning. Don’t understand your beef with pedagogy though! I have been criticised before, on an interview, for overusing that term rather than something simpler like ‘practice’. It still rankles now – should we dumb down our language because some people use it as a label for dodgy practice? That appears rather like a straw man argument to me. Of course we shouldn’t dumb down our language, but we should be precise. Pedagogy has become a catch-all term for gimmickry and as such requires unpicking. Language, especially specialised language is often used to obfuscate ignorance.